When can we stop wondering what Banksy looks like? Banksy caused a stir in Los Angeles last week when a number of pieces attributed to the artist started showing around town in the days preceding the Oscars. From a cocktail-slurping Mickey Mouse flirting with a model to a child aiming a crayon-loaded machine gun, the new graffiti bore Banksy's trademark style and tone. Is this a picture of Banksy in LA? Has Banksy Finally Been Photographed? Quick answer: It might be Banksy. Banksy's name is almost always preceded by words like "elusive," and despite his being referred to as Britain's Andy Warhol, very few people know the true identity of the artist. So when a blog posts a photo of a scruffy, white guy with a hat hiding his face, it must be a big deal because everybody really wants to know Banksy's true identity. Right? But the truth is, we don't really want to know who Banksy is. It's inevitably much more fun to think of some masked Warhol biting his thumb at the mainstream art world and taking the mystique of an anonymous graffiti tag to its inevitable conclusion. Banksy is everywhere and nowhere at the same time. 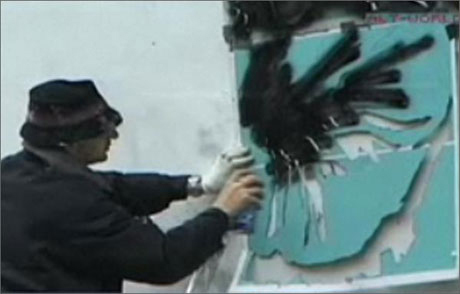 After a number of failed attempts by major magazines like the New Yorker and Esquire to unmask the artist, the Daily Mail capped off a year-long investigation in July 2008 with a doozy of a headline: "Graffiti artist Banksy unmasked." Banksy's real name is Robin Gunningham, according to the Daily Mail. Now internationally famous for his countercultural and sometimes anarchic bend, Banksy actually grew up in an affluent suburb near Bristol and attended private school. The boy showed a natural talent for art, became involved in the local graffiti scene, and eventually dropped off the map around the time that Banksy began to gain notoriety. The Banksy camp neither confirmed nor denied the results of the Daily Mail's story, and Banksy's alleged parents coyly denied they had a son to the reporter. But what makes the claim believable is the original clue: a photo of the real Banksy. Like all the photos of the "real" Banksy, the image matches the descriptions of the artist printed by the rare few who've interviewed someone claiming to be Banksy. 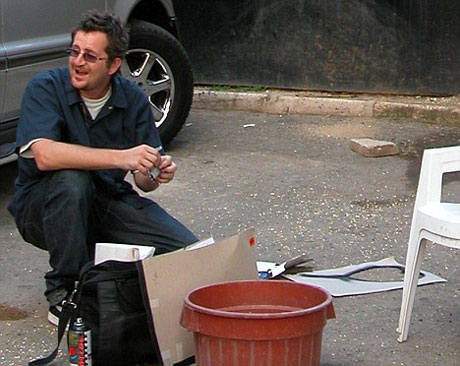 Bansky is white, 28, scruffy casual - jeans, T-shirt, a silver tooth, silver chain and silver earring. He looks like a cross between Jimmy Nail and Mike Skinner of the Streets. Joel Unangst, who had the nearly unprecedented experience of meeting Banksy last year, in Los Angeles, when the artist rented a warehouse from him for an exhibition, can confirm that Banksy often dresses in a T-shirt, shorts, and sneakers. He’s the only man in this dirty, poisonous little road beneath London’s Waterloo Station that nobody refers to by name. They just come up to him, ask a quick question and then scuttle off. He’s tall and well built with slightly shabby hair. The photos peppered in these pieces matched other "Banksy unmasked" type articles. Most feature the now famous photo from Jamaica of a scruffy man wearing sneakers and a T-shirt smiling slightly and standing next to a can of spray paint. 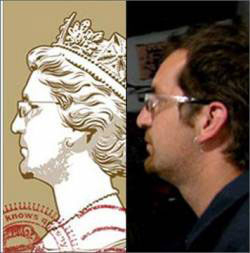 Gawker claimed to have uncovered a profile of Banksy used by fellow street artist Mister Aitch to create a print. Same silver earring, unshaven face, dark hair, T-shirt. But the deeper you dig, the more you realize that Banksy looks like every man -- especially the young street art lovers in Los Angeles -- which brings us back to the latest Banksy unmasking photo. The quote on the side refers to a star-studded 2006 solo show in Los Angeles that starred a graffiti'd elephant and served as Banky debutante moment in Hollywood. When "Exit Through the Gift Shop" won its Oscar nod, the Academy explicitly denied Banksy the opportunity to attend the show in disguise. Banksy stomped his foot a little and started putting his work all over town. The unmasking photo appeared just after Banksy's film lost the award to "Inside Job," and the familiar conversation about Banksy's identity lit up the Internet once again. This is the clever path Banksy makes us walk. Banksy's knack for anonymity intrigues us. And even if he stepped forward or another more trustworthy exposé were published, we probably wouldn't stop wondering because wondering is fun -- like traversing a Möbius strip, figuring out Banksy's identity is an infinite, twisted loop. The quest is not unlike the prank that is Banksy's movie, actually. You're forced to wonder what's true for 90 minutes and leave the theater still trying to figure out if Banksy won, if he tricked you. The only thing to do is watch the movie again and see if you missed any clues.